Why countertop cloudiness or haze can develop ? Have you noticed a haze or cloudiness on the surface of your natural stone benchtops? Natural stone benchtops provide an elegant focal point for kitchens and bathrooms. But when the clarity of the finish is diminished by a haze or cloudiness, countertops quickly become an eyesore. There are a number of reasons why the problem develops. Here are the details about what causes this problem and what can be done to resolve it. People are often incorrectly advised to use window cleaner or soap water on benchtops. 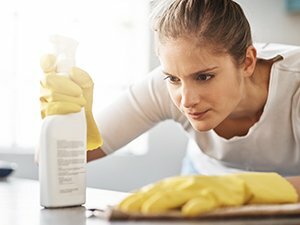 Over time, a buildup of improper cleaning products can cause a haze or cloudiness to develop on the surface of the stone. Abrasive cleaners, such as scouring powder, can also damage the finish of a bench top. We always recommend pH-neutral, stone-safe cleaning products. If these products are not effective in removing the haze or cloudiness, it’s probably time to have your stone professionally cleaned and sealed or refinished. Abrasive cleaning tools, just like abrasive cleaners, can destroy or damage the finish of natural stone bench top. Oil-based spills that are not cleaned up right away can seep into the porous surface of the stone, causing the stone to develop a haze or cloudiness. Oil can be very difficult to remove on most stone. If it has dried on the surface, carefully use a sharp razor to scrape off the excess. Sprinkle a generous portion of poultice powder on the spill and let stand for 12-24 hours. Remove the dry poultice and prepare a solution of degreaser and water. Apply this solution to the spill and keep it wet for 30 minutes. Vacuum the solution up and blot the remainder with a clean white cloth. If the haze or cloudiness is still present, poultice with a solvent (commercial paint remover works well) and poultice powder. Ideally, stone sealer is absorbed into the porous surface of the stone and does not affect the appearance of the finish at all. A haze or cloudiness can be caused by a stone sealer for a number of reasons. It may be because the wrong sealer is used. Sometimes a highly polished top doesn’t need to be sealed at all, therefore the sealer doesn’t absorb into the stone. Even if the stone does need to be sealed and the appropriate sealer is used, a haze or cloudiness can still develop if the sealer is improperly applied. A professional stone restoration contractor will need to resolve this situation. Hard water deposits can cause a haze or cloudiness on the surface of natural stone. Sometimes, if the buildup is not too severe, it can be safely removed using pH-neutral, stone-safe cleaner. If not, a professional restoration contractor can restore the finish. Feel free to contact us with questions or concerns about removing a haze or cloudiness from the surface of your natural stone bench tops. This is one of a series of articles written and published on behalf of Stone and Tile PROS Partners. Complete Stone Care and Protection services Sydney and all of New South Wales with natural stone, terrazzo and tile care. We can make it look like new again and help you keep it looking that way.